We were not hungry at all but then since we’re in the San Jose Flea Market and there are plenty of Mexican food around, we decided to drop by one of the authentic Mexican places to try out their breakfast. Ordering this was easy since the sign board is in English. If this had been in Spanish, we would have not even dared to attempt going in. Hi All: Am back. It was a hectic past week for me. First, my 2.5 year old PC decided to go slow on me all of the sudden. Everything seems to grind to a virtual halt … I think it’s all the photos that I had been dumping into it (23,000 already!). It was so slow that it took 5 minutes to just to edit ONE photo. It was that agonizingly slow. So, we decided to go get a new PC … spanking new one with Vista on it. I like Vista and boy … it’s really fast even with all the Aero stuff on Vista. And before I had the time to properly setup the new PC, I had to travel again on work. Just got back last night and back in action. Well … that means that another travel series is now in the works. I like the motel we stayed in Santa Clara. They give better free breakfast than most of the other hotels we been to. 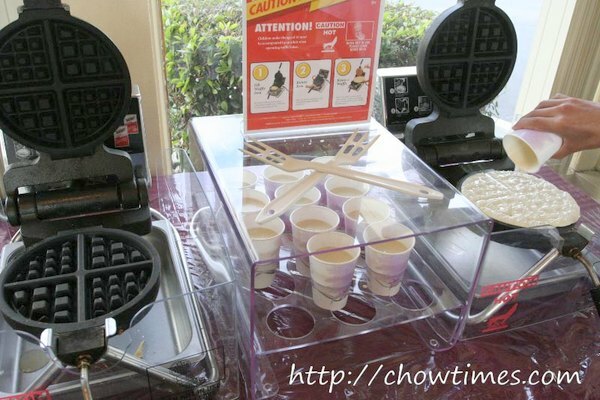 Instead of giving the standard cold pastry and coffee, they even have a waffle making machine. I like hot breakfast. The coffee was pretty decent too. 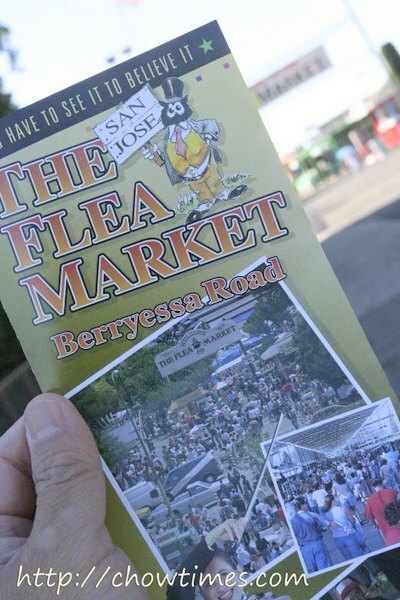 We picked up a brochure at the hotel about the world’s largest flea market. We thought that warrants checking out although it was not part of our plan since it’s just around the corner from Santa Clara. 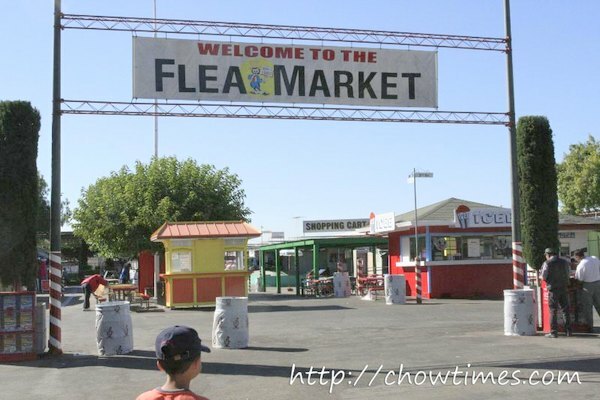 It is called the San Jose Flea Market on Berryessa Road. Locating this “no-tech” market is really easy. 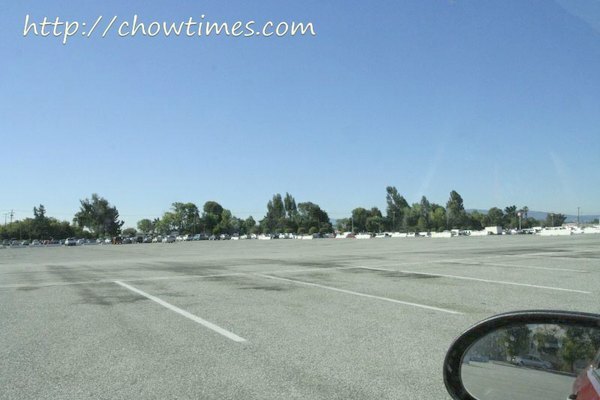 The parking lot is huge and reminds me of those in large theme parks. Looking at the size of the car park alone I can imagine how big this flea market is. 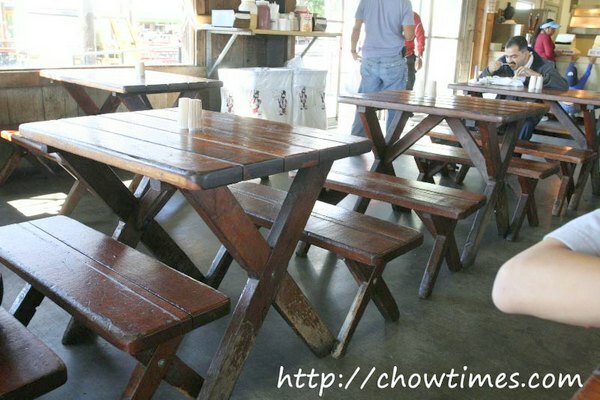 Although there is no entrance fees for the flea market, parking costs $6. We went very early when they just about to open. It had been a long day at Great America where we only had hot dogs, M&Ms and chips to sustain us since breakfast. We were quite hungry by the time we got out of the theme park. We already knew where we’re gonna go for dinner that day. Where we were staying in, there seems to have a lot of Asian restaurants, in particular Korean. It had been quite a number of days since we had a full Asian meal and we really wanted rice and noodles. Just a walk across the street from our hotel was Pho Hoa. We have already spotted that familiar name the day before. It was an unanimous choice for dinner. Besides fried rice, our boys are quite addicted to pho too. We had been to a Pho Hoa in Richmond before. We don’t rate the pho in Richmond’s Pho Hoa as some of the best we tasted but since we’re on the road and have been missing real Asian food, this is just perfect. 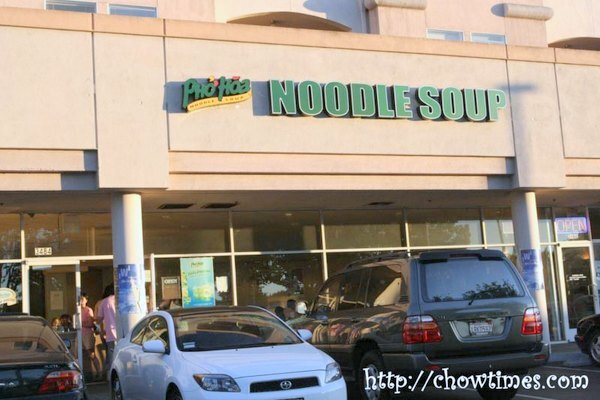 Pho Hoa is a franchise and have dozens of outlets throughout the US, Canada and Asia. They proudly pasted a big sign on their entrance about them being in the Top 400 Restaurants in America. I don’t know what the significance it is of this Top 400 rank … I guess it is a big deal here in the US. We also found out that Pho Hoa first started in the neighboring city of San Jose. 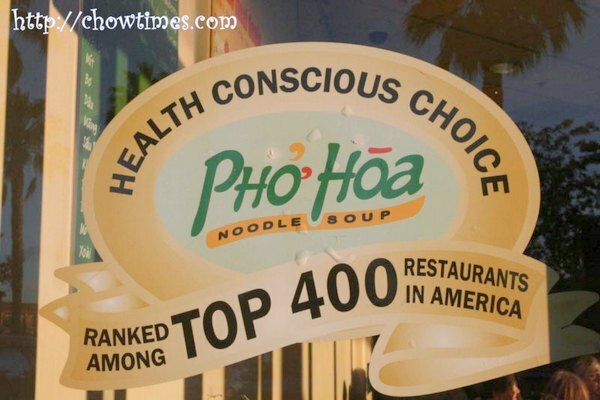 Wow … we are close to the epicenter of the Pho Hoa movement. This had gotta be good. 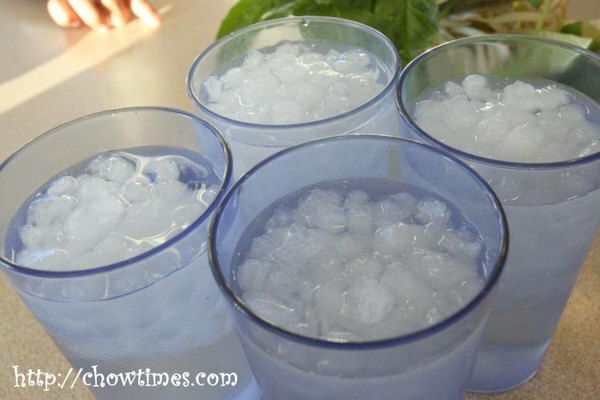 Here they gave all of us iced water. The ice is different … not in cubes or tubes but in pebble size. Nanzaro calls these ice-cutes, not cubes. The bean sprouts were fresh and crunchy. You can see they are not fresh if the roots are brownish. 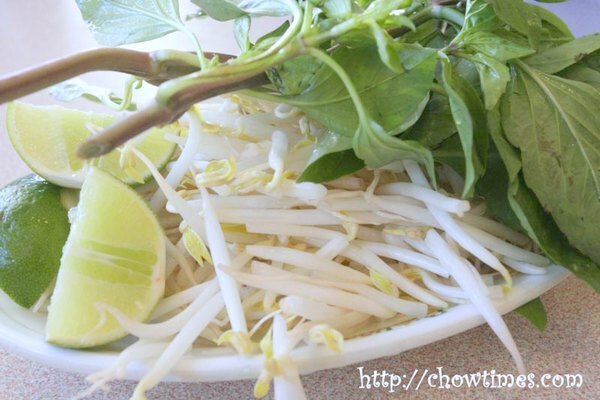 We see some people putting these bean sprouts in their pho … yucks, we hate to do that. Instead, we just munch on them while waiting for the pho to be brought to the table. Oh, we don’t use the leafy vegetable and lime too. This gotta be the highlight of the vacation for the boys. They wanted to snuck in a theme park on the vacation. I am all for it as I love roller coasters and such myself. However, Suanne vehemently protested that she will absolutely NOT go on any rides. He he he … she had a torrid time when we were in Disneyland/California Adventure and Knotts Berry Farm when we pestered her to have a go on the rides. Why even the kiddie rides freaks her out. There are only two choices we can find for Theme Park — it is either Six Flags and Great America. Six Flags is out of the way in terms of the general direction we are heading and I think Six Flags have wilder rides. Great America seems to be a more family oriented. 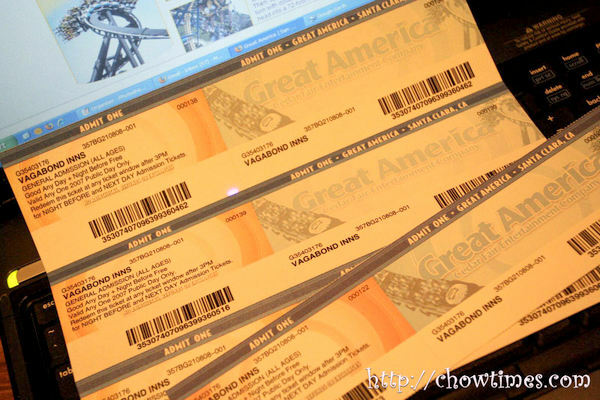 One tip about going to the park, get your tickets before you get to the park. We got ours at the hotel we were staying in. I think it was about $10 less or so per ticket. 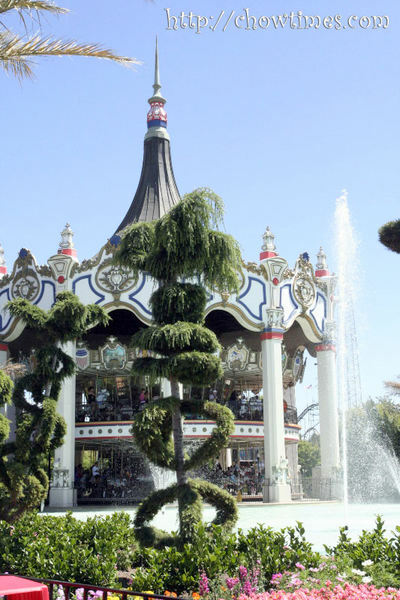 The one and only reason we headed to Santa Clara before going to San Francisco is because of the theme park stop. 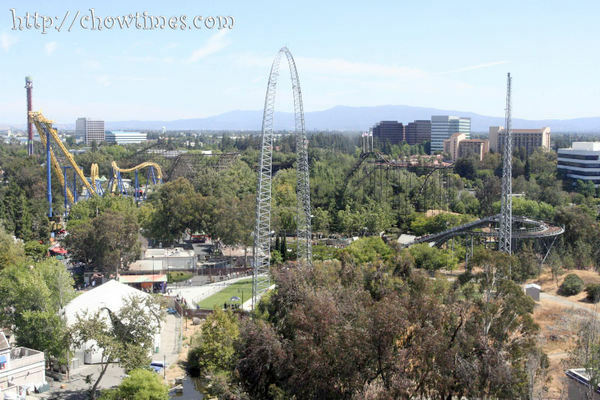 In terms of size, Great America is no where near Disneyland although one would need at least 1 day to cover this park. The park is very compact and very walkable with lots of seats and shades around. Getting from one ride to another is pretty quick and helps us cover as much rides as we wanted. We were there on a Saturday and expected a large crowd on a summer weekend. However, it was not as crowded as I feared. The lines were not too bad as we have seen worse in Disneyland. A long wait on the popular rides is like 15-30 minutes only. You know, the few days before we arrived, there was a fatality in this park in the water section of the park. Apparently a toddler drowned in the newly opened wave pool. It was all over the news in Santa Clara. We did not spend any time at the water section because we did not have the time. The star attraction of this park is the Top Gun ride. 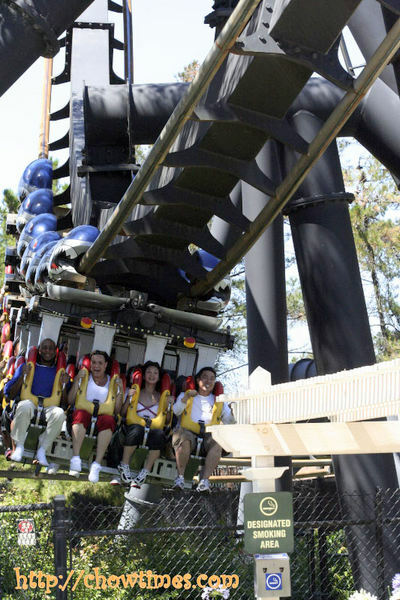 It is a long inverted roller coaster with all imaginable turns and twists you can ever imagine. It’s based on the experience of riding in a fighter plane. We headed to this ride first. Arkensen went on this ride twice. Here is the video of him on the ride. I did not count on driving that far. On the map, Yosemite to Santa Clara does look near and I thought it would be Interstate road conditions all the way. A big part of the trip are on windy, narrow roads until I get to the valley. Dang … California sure had so many fruit plantations. It was delightful driving through so many fruit stops. We stopped at one place to get some strawberries. 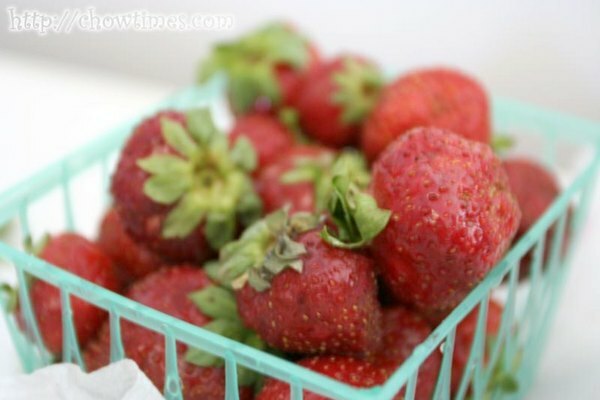 The strawberries looked so good — big and bright red. They are very good and cheap too. We asked the guy at the stall to wash a basket for us to eat in the car but he said it’s already cleaned. We did not trust him. Since we had so much bottled water from the road trip to Death Valley, we gave it a thorough rinse before we set on our way. Two years ago when we had our Disneyland vacation, we noticed a lot of burger joints called In-N-Out. We did not try any that time and so made it a point to drop by one … one more food place to blog about, you see. 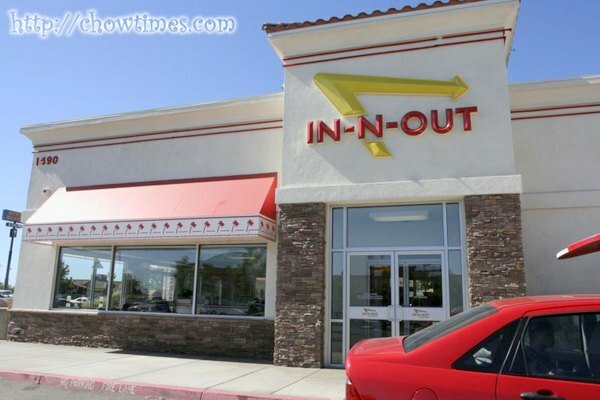 In-N-Out is basically a California burger place. 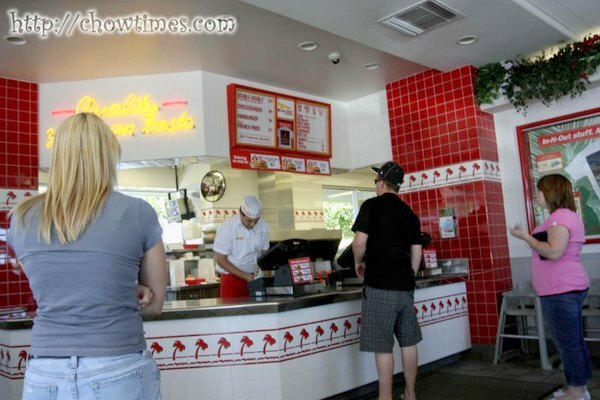 Although they do not have as many outlets like McDonalds, Wendy’s, DQ, etc, they are very popular among Californians. 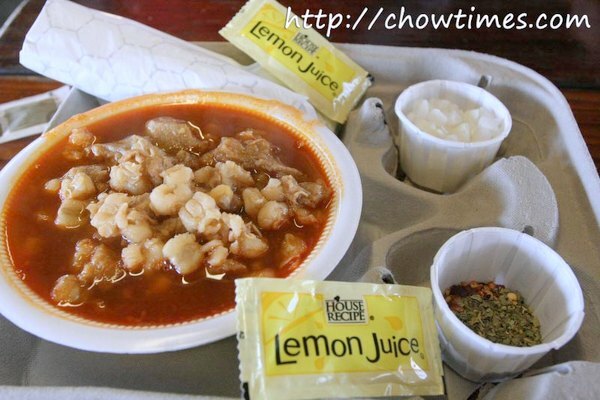 What we like is their menu — it is so simple. They have only three, as I recall. There is the Cheeseburger and the Hamburger … and then there is the Double-Double. Off hand, you would know what burger size you want. You know, in McD’s, it’s kind of confusing sometimes making the difference between a BigMac, Big Xtra, Quarter Pounders and what nots. 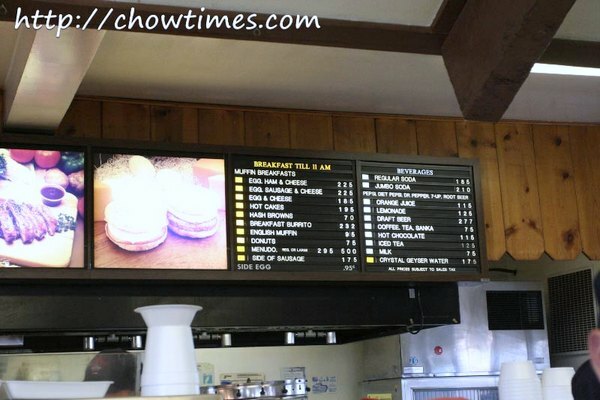 See that menu above the cashier’s head? Well, the menu is that simple. I like it. The major difference in In-N-Out is their focus on freshness. The burgers and fries are made to order. So, you see a bit of a wait while they prepare your order.